We hit the road early this morning looking to get on a deep water perch bite. The skies were overcast and dry but the wind was howling. The day was suppose to be pretty consistent with winds in the high teens to low 20’s and gusts higher. The weatherman was spot on! As we started dropping our lines, we found perch scattered randomly but never concentrated. We were working a deep mud flat where the fish cruise and feed actively throughout the morning hours feeding on blood worms. In general, if a fish showed up on the Vexilar screen, it bit. Hooking up was a different story. We were both fishing a drop shot rig with brightly colored jigs. Getting down to these fish in a quick manner is probably the most important part of our set up. In order to get through the water column, our flashers on the end of the line weigh up to 1.5 ounces. On this trip, we were both running orange jigs with the main difference being that one had a glow back and the other had chartreuse. We saw no difference as we both caught about the same number of fish. Shortly after the perch started biting, we were moving. These fish roam constantly and keeping up with them and figuring out what path they are taking is the most difficult part. After about 1.5 hours, of picking at the fish, we had lost them to a point where we went an hour without seeing a fish. As we worked along various paths we have seen these fish run, we made a last ditched effort and checked a spot that we rarely see them. After punching holes, we started to work through them. We went a few holes and finally found fish. They would come check baits but not touch at. After spending about five minutes working a single hole, I finally had a fish come in with aggression. The strange part was that this fish came in from above my six foot zoom on my flasher. The fish also hit my top jig being only the second perch to do this so far this winter. I lost the fish before it got to the top of the hole and that was when we decided that the bite was off for the day. With the morning bite over, we figured a warm lunch and a break from the relentless wind sounded much more enticing than any more punishment. After lunch and the ride home, there was one more spot to tackle and look for some crappie and a few more perch. After repacking my truck with the necessary gear, I picked up a buddy and we were on our way. From 3-5:15 we were fishing completely different than I had all morning. The difference took a few fish to adjust from pounding the bottom to finessing fish coming through suspending. 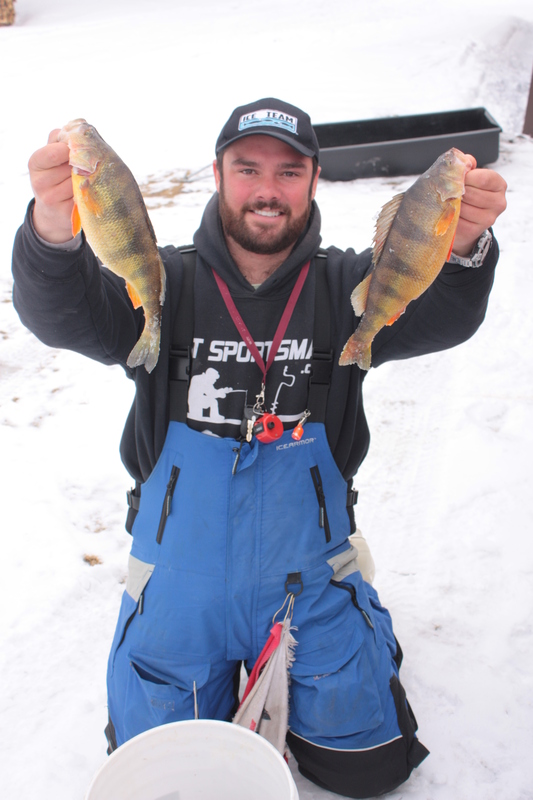 We ran Maki Plastics on Bentley jigs in order to put these fish on the ice. The crappie fishing was slow until about 4:45 but in the first hour we had no issue icing perch, pumpkinseed, and bass. As the day wore on, the fish started to suspend higher and higher. When the crappie turned on, it was really on. We checked holes all over but only had good luck out of one. At one point I was fishing in 12 FOW and had fish stacked throughout the whole water column. We took turns pulling out 11″ crappie one right after another. They were hitting best on glow plastics tipped with a maggot. But in reality they were smacking everything we threw down there as long as it was falling. As soon as the bite started, it stopped. Before it was dark out we were packing up the truck and headed home. The fish were pretty easy to read this evening and we were thankful they gave us the nod that they were done and that it was time to head home and finally escape the wind for a few hours before hitting the ice again tomorrow! Could you describe your drop-shot rig pls ? Thanks, that’s very helpful. I’ll have to rig at least one line that way for the coming weekend. Can’t hurt. It put 38 perch on the ice today!